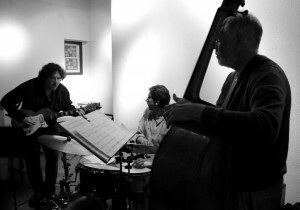 The Actual Trio – John Schott, Dan Seamans, and John Hanes – came together to play once a month at the Actual Cafe in Oakland in January of 2012; our fiftieth show there will be February 7, 2016. Our debut CD.was produced by Hans Wendl, and released on Tzadik. The eight original compositions were recorded in one day at Berkeley’s legendary Fantasy Studios. In November we had a great time playing in Los Angeles, Bakersfield, Santa Barbara, Arcata, Portland, Eugene, and the wonderful Royal Room in Seattle. Randy Hussong made a great poster for the tour: Actual Trio West Coast Tour poster. 1. ERIA (excerpt) - ERIA - an excerpt from the forthcoming Actual Trio CD. John Hanes, drums; Dan Seamans, bass; John Schott, guitar and composition; produced by Hans Wendl. 2. Egyptians (excerpt) - Egyptians - an excerpt from the forthcoming Actual Trio CD. John Hanes, drums; Dan Seamans, bass; John Schott, guitar and composition; produced by Hans Wendl. 3. Actual Theme (excerpt) - Actual Theme - an excerpt from the forthcoming Actual Trio CD. John Hanes, drums; Dan Seamans, bass; John Schott, guitar and composition; produced by Hans Wendl.